Buy MOJO 2: Horn Section at Big Fish Audio. COULD WANT. AND SO MUCH MORE. We recorded 13 different brass and reed instruments for MOJO 2 to fulfill any horn need you’ll encounter. Each horn comes with 13 different articulations including Sustains, Staccato, Stabs, Bend Down, Octave Run Down & Up, Doits, Rise To Hit, Shakes, Trills, Swells, Crescendos, and Falls, as well as up to four velocity layers and three round robins. With Legato Mode you can play the most realistic melodies possible. We meticulously recorded the transition period between each and every note, allowing you to play beautiful horn lines that sound truly lifelike. 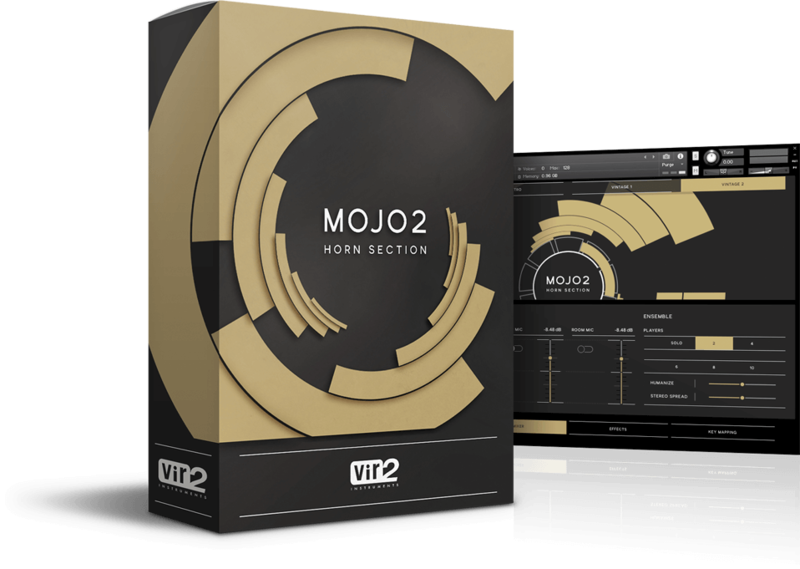 MOJO 2 lets you instantly adjust from 1 to 10 players per instrument to add extra depth and power to your performance. Further parameters give you control over the humanization and stereo spread of the ensemble. Blend the three available mic positions (close, near, and room) to get the perfect mix. Utilize keynoise overlay to introduce the sound of the musician's interaction with the instrument, and tailor the horns with an extensive FX suite. There are four unique Era modes which act as time machines, effortlessly transporting all thirteen included horns from one iconic era to the next. Era settings include: Modern, Retro (60’s-70’s), Vintage 1 (40’s-50’s), and Vintage 2 (20’s-30’s). The Performance page offers both global and articulation-specific controls. Dive into the customization of how the horn parts are played and how the sound is shaped with powerful controls over volume, release length, legato, sustain vibrato (real and simulated), pitch bend range, keynoise, round robins, and more. The Mixer page includes controls for all three mic positions: close, near, and room, as well as a full mix option (a pre-mix of all three mic positions for an easier memory load). Also, control your ensemble settings here with options from 1 to 10 players for a fuller sound. All the included effects have been specifically curated for MOJO 2 to ensure you get the best possible results. Control the EQ, Cabinet, Saturation, Tape Saturator, Compressor, Limiter, Delay, and Reverb, each with their own specific parameters and presets. Customize the keyboard layout and change how and where the different articulations and release samples are triggered. It has never been easier for an instrument to integrate with your workflow! MOJO 2: Horn Section has been designed for seamless integration with the Komplete Kontrol and Maschine, offering you a unique hands-on experience. Manipulate MOJO 2’s interface using the controls of all NKS compatible hardware.